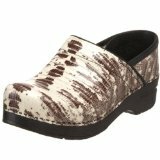 If you work in a kitchen, classroom, hospital or other environment where you’re on your feet all day, you know the value of a good pair of clogs like this Snake one from Dansko. Made specifically to prevent foot and back discomfort associated with hours of standing, the leather slip-on design features a roomy fit in front and a PU outsole for durability and shock absorption. With its textured snake print upper that goes so well with denims and other casual faves, the Professional makes for not only a super-comfortable work shoe but a pretty cool fashion statement as well.